Collaborate with colleagues from the North and South. Development practitioners from 153 countries and 500 different organizations have developed course projects that are impacting over 400,000 people. See a sample assignment from Kenya. Courses are offered every two months. Current offering dates are in the column to the left. To enroll, simply click on the course links below. A Module of 4 Courses. Complete this diploma in 2 months in a blended online/live workshop program. Learn how. A Module of 4 Courses. If you work with a nonprofit on programs such as food banks, animal welfare, teen drop-in centers, homeless shelters, day care centers, arts & culture, education, health, human services, community development, or environmental restoration—the Diploma Program 240 will help you develop a sustainable, fundable, impact oriented project. STEP 1. Enroll in the first course of this series: OL 201. 201 Designing and Funding Nonprofit Programs 1: We are committed to results-based programs. You will learn to incorporate community-identified need into the design of your project and research project activities that have shown evidence of having worked at solving challenges. Contemporary methods of developing sustainable, impact oriented projects. Gain practical field experience using evidence-based activities. Develop a real project in real-time. Over 40% student chosen projects in our courses work to solve problems linked to climate change. This four-course module will lead you into developing projects on-the-ground that focus on community-based adaptation to climate change. For practitioners who wish to begin working now at the community level to successfully adapt to the challenges that face us. STEP 1. Enroll in the first course of this series: OL 341. 341 Community Based Adaptation: Gain an insight into contemporary methods of developing community based, sustainable, impact-oriented projects. Gain practical field tools and develop a range of skills: facilitating participatory needs assessments and DRR assessments, designing projects, and evidence-based activities. Develop a real project in real time. Develop a Real Project in Real Time. We’ll walk you, step-by-step, through a community-based project, using proven methods. Learn a range of skills including participatory needs assessments and evidence-based project design. You will learn strategies from others in the class facing similar challenges. Become the Solution. STEP 1. Enroll in the first course of this series: OL 101. 101 Designing and Funding Sustainable Development Projects: Embed impact into your project design with powerful management tools. Log Frames, detailed budgets, schedules, compelling fact sheets, M&E plans, outcomes & impact. These tools will communicate to donors & stakeholders exactly what your project will accomplish. Take 101 combined with 102 into a 100% digital format at Udemy. A Module of 8 Courses. First Course: 341: Designing and Funding CBA Projects. This diploma program of online field courses integrates community-based adaptation to climate change, disaster risk reduction, and rural development. To earn a diploma simply complete four foundation courses, then select four elective courses from a variety of electives to tailor the diploma program to meet your needs and interests. The program will provide you with the job skills, tools, and methods to both meet today’s challenges and to take on new professional positions in adaptation, DRR and development. Implement a 12-month family gardening project. Learn about food security, good nutrition, and the garden activities that support them — and then learn how to build a project that puts your community on the path to using their own skills to address their specific needs. Become a Solution. How do you care for & maintain a food garden? How do you control pests? What happens if you have desert soil – or a shortage of water? Learn how to combine garden produce with daily staples to prepare nutritious meals that contain vitamins A, C and D.
Students develop a community-based water use management plan with community members beginning with a participatory mapping of water resources and uses, and then consult with a water management expert to develop a training program in implementing conservation and water harvesting technologies. Full Syllabus. 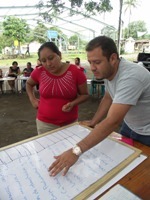 Students and community members will develop a participatory mapping of crop systems, and soil and water resources, and then consult with an expert in soil, water and agriculture to develop a participatory training process implementing a Climate Smart Agricultural Program specific to their local context. Full syllabus. Students analyze disaster related risks and facilitate the development of a community-based DRR committee for developing a DRR plan that includes DRR consciousness raising, an early warning system, organizing specialized DRR teams, and a risk reduction and mitigation workshop for community members. Full syllabus. This is a blended learning experience. During the month prior to a five day live workshop, guided by CSDi staff, you will conduct needs assessments with a local community—in the country where you work—in preparation for the workshop. These will become the basis of your project. Arriving at the workshop, you will spend five days developing and fine-tuning a project that will address the specific context that your community faces. As a bonus, at the end of the live workshop, upon returning home, you will return to work with your community—and launch your project’s implementation— all under the continuing support and guidance of your CSDi workshop leader. Are you a donor, a development practitioner, in a job transition, or a student who wants to learn more about what works in designing impact-oriented projects? Our online courses use each class assignment as a concrete step in developing a real project within a real community. You will take an assignment into the field and use it as a solution-oriented activity that you do together with community members—thereby finishing one component of the project you are developing in the class. And there you have it: an online field course with tangible, concrete results. Please free to contact us if you are interested in learning more about dates and how our training programs can increase your program impact.